The expanded, deluxe edition of the critically acclaimed Texas Thunder Soul 1968- 1974. 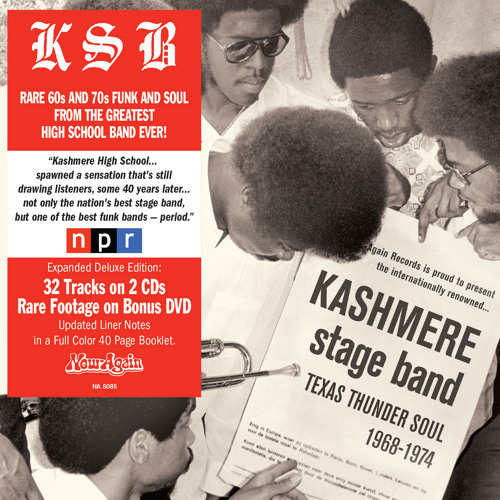 Rare, heavy soul, funk and jazz recorded by the high school heavyweights Kashmere Stage Band, and released in conjunction with the award-winning documentary Thunder Soul: The True Story of Conrad Johnson and the Kashmere Stage Band. 2 CD/DVD in a 8-panel digipak with a 40 page booklet; 3LP Gatefold/DVD with a 24 page booklet. DVD contains the shorts Texas Jewels: The Making of Texas Thunder Soul, Kashmere Stage Band on Jazz: Yesterday, Today, Forever, and Prof. and his Band: A Documentary by Charles Porter. Yes! That's the way to lead!